So out towards the West Coast again, this time hunting down a couple of peaks to add to the nearly finished tally. Woolshed Hill (1429m) had been on the list for a while as a backup peak, and it was dearly needed now with only nine days to complete the challenge. The weather around Christmas had been abnormally average and numerous storms were moving across New Zealand to welcome in the festive season (not as festive as the northern hemisphere with their wintry weather and white Christmases)… thankfully I found a gap! Out again crossing the plains, over Porters and into the Craigieburns. 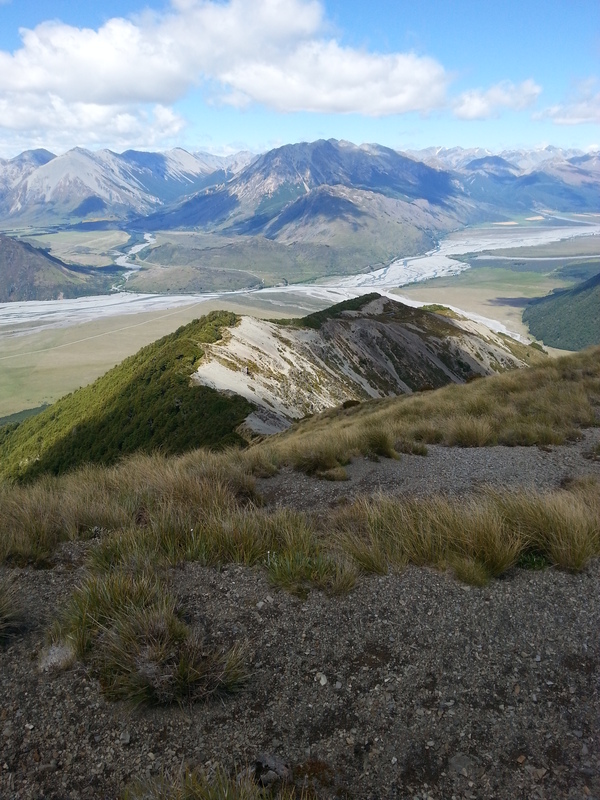 Woolshed Hill is the first mountain you see if you glance to the right when turning left at Mt White Bridge, before Arthur’s Pass or crossing the Waimakariri. At 1429m, it’s a nice climb from the Waimak below and has some stunning views of the Hawdon Valley (so I had been told). 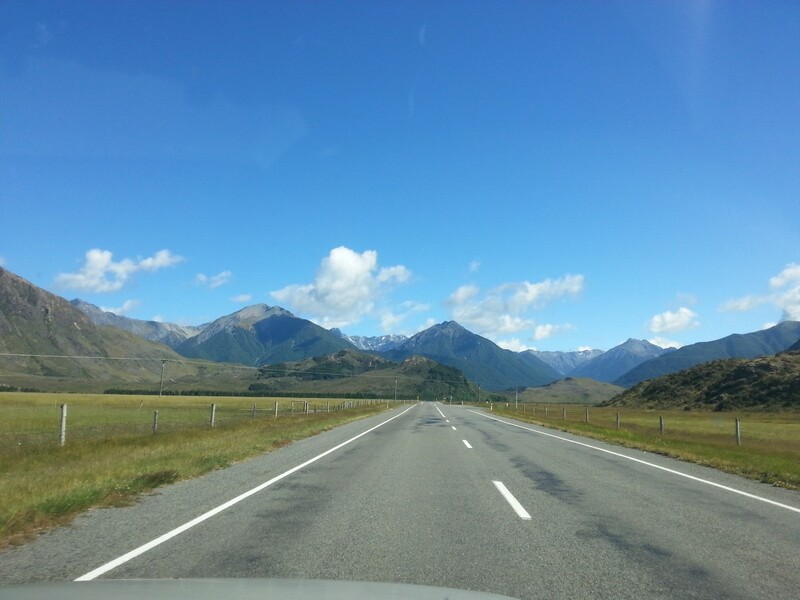 Thankfully the weather cleared as I head over the pass, sun shining and blue skies – like a different world! I parked at Hawdon Shelter, ran past Kitson Lodge and up onto the trail leading to the open ridgeline. 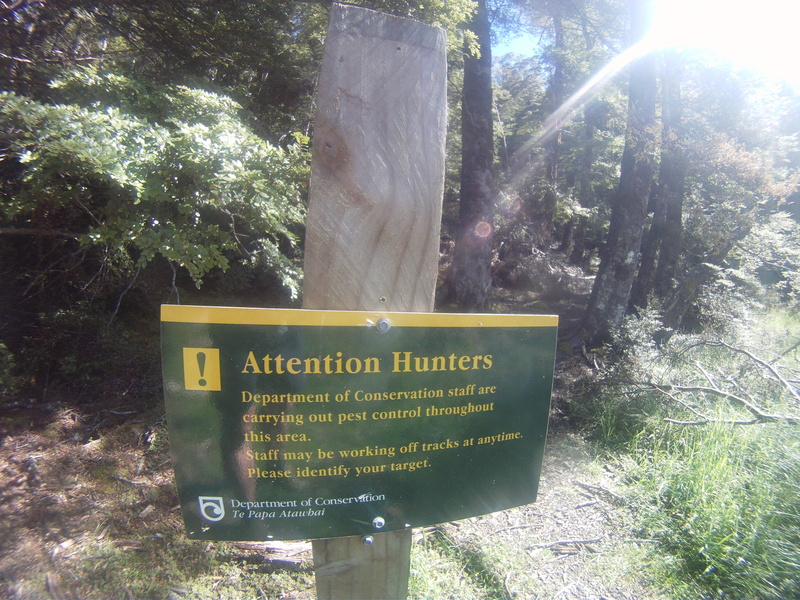 On the way I passed a great sign warning people that hunters might shoot them – and for hunters to identify their targets before shooting – you’d really hope that happened anyway wouldn’t you?? Wow, the first section was steep – a bit like that of Mt Royal in the Richmond Ranges – you had to fully go for it over the slippery rocks and use your arms on the branches as you climbed your way up the slopes. After about 500m, (with 400m climb) the track started to level off, luring me into a false sense of security that I was near the top (already? surely not!). Yes, surely not – I wasn’t even a 1/3 up the hill yet – and passing pt.942m I decided to speed up my pace. Not for long though, as I continued and broke the treeline, I spotted the summit ahead, still a way to go and a lot of scree climbing left, with not much feeling in my legs to do it. Still, I carried on past a flock of seagulls flocking above my head – keeping them in the corner of my eye as I wasn’t sure whether they were going for me or the other life forms in the open scrub. I found a beautiful tarn just below pt.1296m which had great views of the Hawdon and The Pyramid (1608m) on the far side of the valley – definitely a lovely camp spot for the backcountry tramper. Stunning in Winter too I bet. Weaving in and out of the woodland along the ridgeline I lost my way slightly and had to backtrack off one of the steeper slopes and go around – the alternative was to edge my way along a bluff which would have meant hurtling down into the Hawdon 700m below (therefore it was a good choice). After passing the last section of scree, the final climb was up a tussocky knob to the summit and summit cairn. A successful push made it to the summit in a good time, and definitely enough to tick yet another peak off in the afternoon. Taking the usual photos on the top, I glanced up the Waimakariri and saw Mt Bruce standing out in the distance with it’s distinctive triangle shape. That was my next goal and only a few hours away. I strapped my bag back on and started the descent. It was a very speedy descent – a great slope to run down, not too steep (apart from the last section) and definitely not flat. Great to keep a rhythm and I hit Kitson Hut easily within 30mins – even with my faffing with the GoPro. 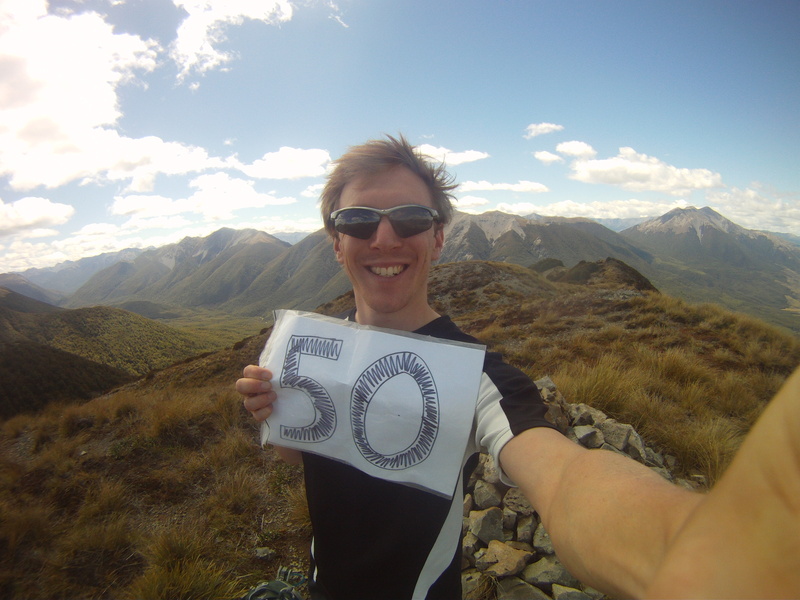 Peak 50 done, only 2 to go now… with Mt Bruce planned for the same day – the pressure is on and only 9 days to go! 1 Pings/Trackbacks for "Peak 50: Woolshed Hill"